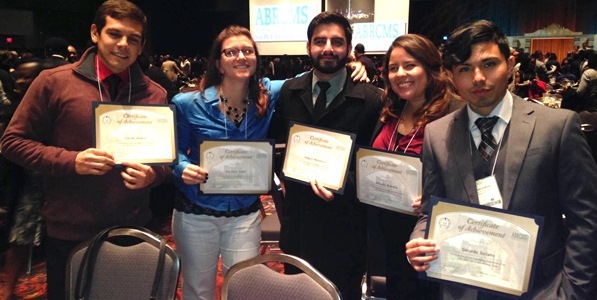 Thirteen SDSU undergraduate students travelled to San Antonio, Texas to present their research at the 14th Annual Biomedical Research Conference for Minority Students (ABRCMS) held November 12-15, 2014. Of the more than 1,800 presentations made over the three days, six scholars from different programs within the Center for the Advancement of Students in Academia (CASA) were recognized for the research in their discipline. Each student received an Outstanding Poster Presentation Award along with a monetary prize. Two MARC scholars were among the recipients of this award. Babgen (Bobby) Manookian, a chemistry major, won for his poster entitled, “Explicit VIbrational Analysis of the Alkyne-Vinylidense Isomerization on a Heterocyclic Rutherium Catalyst”; his SDSU mentor is Dr. Andrew Cooksy. Gerardo (Jerry) Soriano, a chemical physics major and graduating senior, won for his poster entitled, “A Theoretical Study on the Isomerization of the Cyclooctatetraenyl Redical”; his SDSU mentor is Dr. Andrew Cooksy. We congratulate Bobby and Jerry on their outstanding achievement and express our appreciation to their mentor, Dr. Andrew Cooksy, and their lab teams for the support and guidance they provide to our MARC scholars. On behalf of the MARC program, we also congratulate Katrina Cable, Amanda Brambilia, Carlos Alvarez and Carlos Paz for their award and achievement.